In 1994 I “bought the farm” and decided to complete my “cow collection”. For 20 or more years I had collected cows, cow paintings, cow dishes, cow ties, cow pillows, cow toys, cow everything except for an actual live cow! So now that I had a farm I was ready to buy a cow. 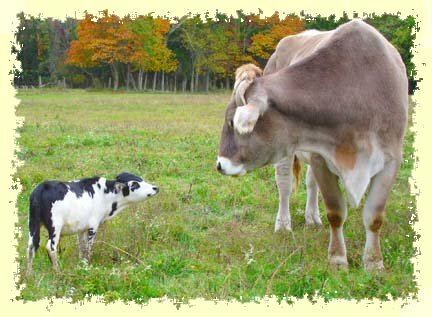 My first cow was Franke, a Brown Swiss dairy breed of cattle. I bought him when he was 3 days old from a Brown Swiss dairy farmer. I asked the farmer to put him in the back of my Volvo station wagon and off we went. I finally had the ultimate piece to my cow collection! Twelve years later Franke (a steer) is still with me but instead of weighing 80 lbs, he weighs 2800 lbs! In spite of his size he is as gentle as a lamb and thinks he is one of the dogs. I bottle fed him from 3-days-old until he was able to eat on his own . He has never had a harsh word or cruel hand laid on him so he knows no fear or aggression towards humans; or any animal for that matter.